Ana Wakefield almost died on Oct. 18, 2017, when a man driving an SUV crossed over the center line on Highway 212 near Damascus and hit her head-on as she was on her way to basketball practice at Multnomah University. For two weeks following the nearly fatal crash, Wakefield's family didn't know if she would live. Her entire left side was paralyzed. Since then, she has had five brain surgeries and has learned to walk, talk and eat all over again. 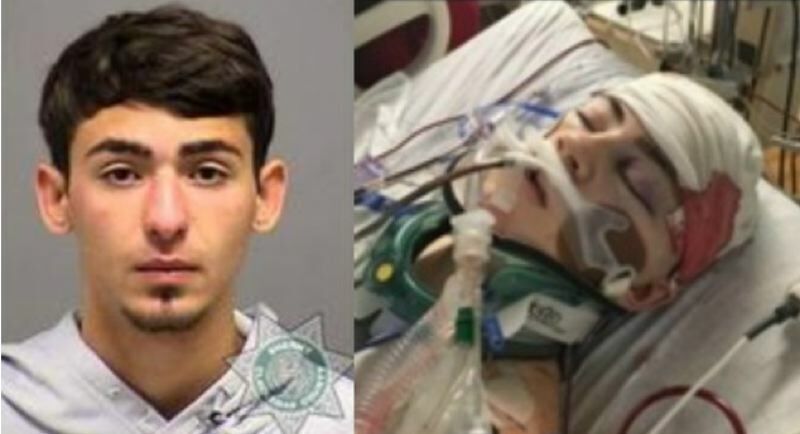 The man suspected of crashing into Wakefield's car and then fleeing the scene, 20-year-old Sequoyha Storck, faces 11 charges including two counts of assault, possession of a stolen motor vehicle, reckless driving, hit-and-run and DUII. He was arrested on June 21, 2018. On Oct. 16, Wakefield, 21, was able to meet some of the firefighters who pulled her out of her car. They gave her the chance to slide down a fire pole and sit in a fire truck, which was a goal she made as part of her recovery. "I loved it, loved getting to honk the horn and getting the lights to go and sit there and actually be kind of in the position of driving again," Wakefield told KOIN 6 News. "It was so fantastic." On Wednesday, Oct. 17, a day before the one-year anniversary of the crash, Wakefield met the doctors and clinical staff who saved her life. She has made incredible progress and she continues to build her physical and mental strength everyday. She said, "I've been hyper-competitive since I was little and I will not quit. I will not say no. Everyone who knows me knows I will work hard and go get what I want." Wakefield's next goal in four months away is to come back to the fire station and use Clackamas Fire auto-extrication tools to cut apart a car. KOIN 6 News contributed to this report.